Many parents feel their kids are “picky eaters,” and we definitely find here at Kids Cook Real Food that working in the kitchen, being involved with food through our online cooking classes for kids, really helps kids be more open to trying and appreciating new foods. But it’s not magic pixie dust, and it doesn’t “work” for everyone. I’m thrilled to share this special interview with Melanie Potock, a speech language pathologist, best-selling author and expert in pediatric feeding. Maybe it blew your mind as it does mine that there are really EIGHT senses, and not just the 5 you learned in elementary school. We talk about how to use those original 5 senses to widen kids’ palates and combat picky eating, but even there you’ll find not-so-obvious golden nuggets like, “It’s not all about taste.” Really?? There’s so much more to the experience of eating that we parents are barely aware of but that we can easily tap into to improve our children’s eating habits! No time to watch the whole video above? Here are the notes! 1:04: Melanie has a unique approach to feeding kids by using all eight senses…wait…eight senses? You heard that right! The first five senses that we learn in first grade (sight, sound, taste, smell and touch) all play into a child’s willingness to try new foods. 2:03: We say we “feast with our eyes.” The way the food is presented visually can impact what they eat. If you give a child a large portion of their preferred food and smaller portions of less preferred foods, the one they like best is visually the most prominent and they will pay most attention to that. 2:57: When exposed to a new food, we compare it to other foods in our “brain files” and make judgements based on that. Kids should be exposed to variety, even if it’s just a small amount, let them see what a variety of foods look like. 4:31: Making food visually appealing and cute for kids is important. Letting them help is even better because it gives them a sense of ownership. 5:23: One of the biggest senses that related to food is touch. Allowing kids to “play” with food, whether that’s helping to wash, peel, chop, or building and creating games with food items helps their sense of touch integrate the food. 6:07: Even if they don’t eat the food, having the sensory experience is beneficial. Research has shown that kids who engage in sensory play with food are more likely to eventually like that food. 7:53: There are two types of smell to consider when introducing kids to food smells. Right under your nostrils and the smell when the food is in your mouth. When a food is in your mouth, you get a different smell. The smell of other things in your mouth like bacteria and other foods stuck in your teeth creates a smell that travels up through the nasal passages from inside your mouth. 9:36: Kids with a heightened sense of smell can try brushing their teeth with water before trying new things to help keep the smell and taste as true to the food as possible. Taking a sip of water not only cleanses your palate from a taste perspective, but also cleanses the aromatic palate. 10:52: Surprisingly sound can impact taste as well. There is some new research showing that the sounds in the environment can impact how you taste food! 13:26: Everyone focuses in on taste, but that’s not all there is to it. We only taste few tastes on our tongue, when you combine taste with smell, that’s flavor and that’s what kids have trouble with. That’s why it’s so important to keep introducing foods in different dishes or prepared with different spices. 14:32: What does Melanie think of the old “plug your nose when you don’t like something” trick? 15:45: Your vestibular sense is your sense of balance and where you are in space. When a child is in a seat with their feet hanging, that’s putting a strain on their vestibular system. Especially if a child has sensory issues, this could lead to feeding difficulties. 16:50: The next sense is the sense of proprioception. This is communication between our joints and muscles that tells our brain where we are in space. It works very closely with our vestibular sense. This will help a child sit upright, not knock over their cup and pierce food with a fork. 18:15: If your child is very clumsy, knocks things over often, doesn’t have the coordination of other kids or has trouble manipulating their body they may benefit from seeing an occupational therapist. If a child’s sense of proprioception is off this can also look like shoving harder than intended or grabbing three orange slices instead of one because they just aren’t aware of how their body is moving. 21:46: The final sense is interoception. It is the internal sense of how our body feels. Being able to sense hunger or the need to go potty are examples. The more you ignore these signs in your body, the harder it get to sense them. A child can also be overreactive to these sensations. 23:31: When dealing with a picky eater, it’s fascinating how many things can be at play that seem unconnected with food. 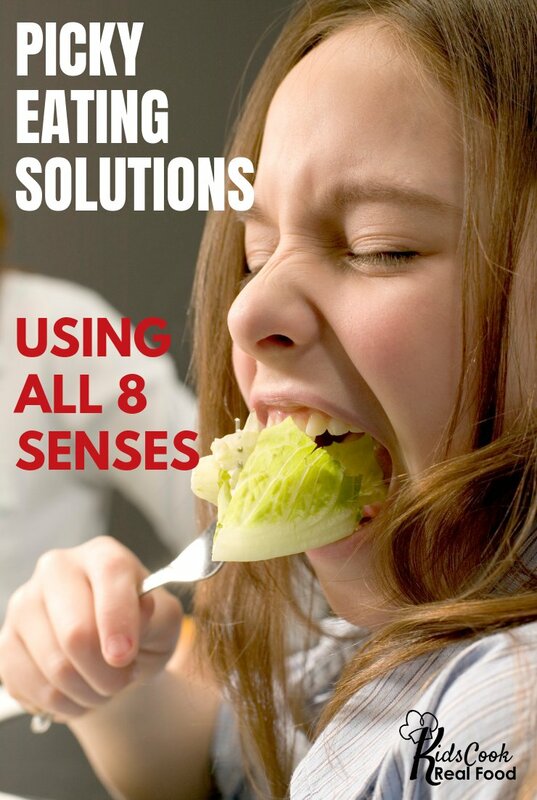 We have a longer interview coming for you later, but wanted to post this shorter video now to share Melanie’s tips for feeding kids and curing picky eaters using all 8 senses. Be sure to keep an eye out for Melanie’s later interview if you enjoyed this one! Melanie Potock, MA, CCC-SLP is a Speech-Language Pathologist, pediatric feeding expert, and most importantly, a mom of a former picky eater. She’s experienced first-hand the stress that parents feel when they are worried about their child’s nutritional health. Fast forward to today, and you’ll find Melanie blending her knowledge of feeding therapy with practical parenting strategies that help the entire family eat healthier. She also trains pediatricians and other health professionals in feeding therapy techniques that really work. She’s the co-author of the award-winning Raising a Healthy, Happy Eater, and her latest book, Adventures in Veggieland will Help Your Kids Learn to Love Vegetables with 100 Easy Activities and Recipes! 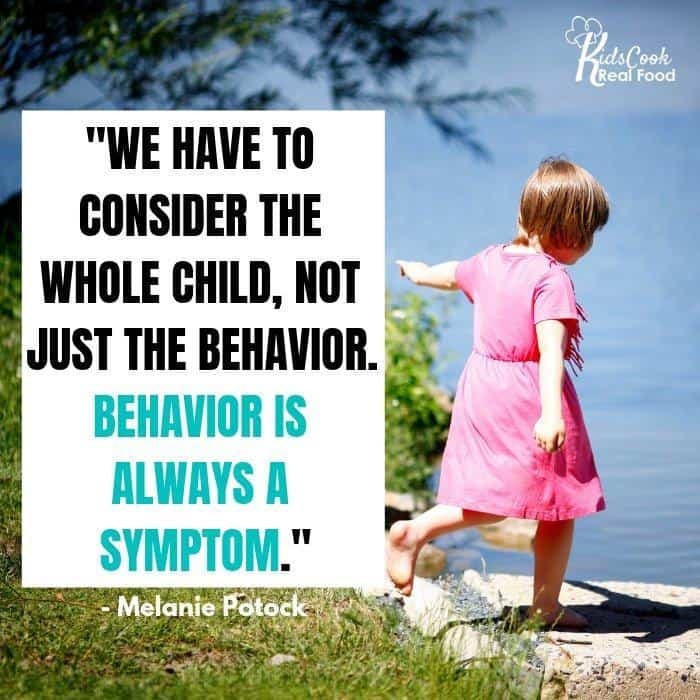 Melanie’s advice has been shared in a variety of television and print media, including The New York Times, CNN.com, Huffington Post and Parents Magazine.